Tropical species are especially vulnerable to climate change, according to FIU researchers. Changes in temperature and weather patterns pose a serious threat to the millions of animal, plant and fungi species found in the tropics. In an article published in Science, lead authors and biology Ph.D. students Timothy Perez and James Stroud explain how species found in environments such as the tropics have lower tolerances to climate change. With greater amounts of thermally sensitive species than environments found at higher latitudes, the threat of global climate change puts tropical species at a greater risk of extinction than their temperate counterparts. The article is coauthored with Kenneth Feeley, researcher in the International Center for Tropical Botany, a partnership between FIU and the National Tropical Botanical Garden. Perez and Stroud also identify gaps in scientific knowledge and suggest how future research may advance the understanding of how species respond to changes in temperature and climate. According to the researchers, a widespread lack of research in the tropics means much of what is known about how species adapt to temperature and climate is geographically biased towards the planet’s temperate zones. Perez and Stroud are tropical ecologists interested in understanding how factors such as climate change and competition may influence global extinction rates. Perez’s dissertation focuses on how environmental changes influence where plant species live and interact with other organisms. 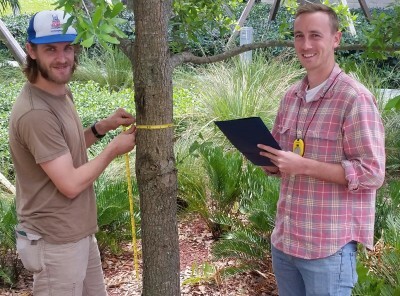 Stroud is devoting his doctoral research to studying the evolution, interactions and community assembly patterns of Anolis lizards in the tropics. I guess it’s a good thing they’re getting rid of that preserve I used to study. Hi, Gregory. Thank you for reading FIU News and for your comment. FIU is not getting rid of the preserve. The area being cleared for the practice fields is the least ecologically valuable part of the preserve. A large portion of the northern part of the preserve has been recently cleared of invasive and exotic trees and plants, and the plan has been to continue with the removal of the remainder of the trees and plants that include Bishofia, shoebutton ardisia, and Brazilian pepper. The valued species are located in the southern portion of the preserve and those will remain untouched. The loss of trees from the northern third of the preserve can be mitigated with the planting of new trees in the 2.95 acres being added to the preserve.